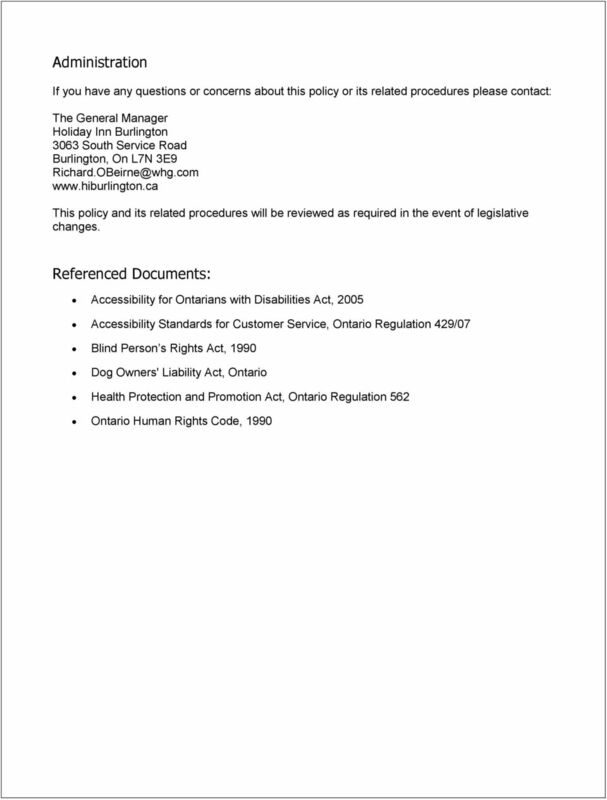 Download "Accessible Customer Service Policy for InnVest Hotels GP IX Ltd., o/a Holiday Inn Burlington"
4 C. Guide Dogs, Service Animals and Service Dogs A guest with a disability that is accompanied by a guide dog, service animal or service dog will be allowed access to premises that are open to the public unless otherwise excluded by law. No pet policies do not apply to guide dogs, service animals and/or service dogs. Food Service Areas: A guest with a disability that is accompanied by a guide dog or service dog will be allowed access to food service areas that are open to the public unless otherwise excluded by law. 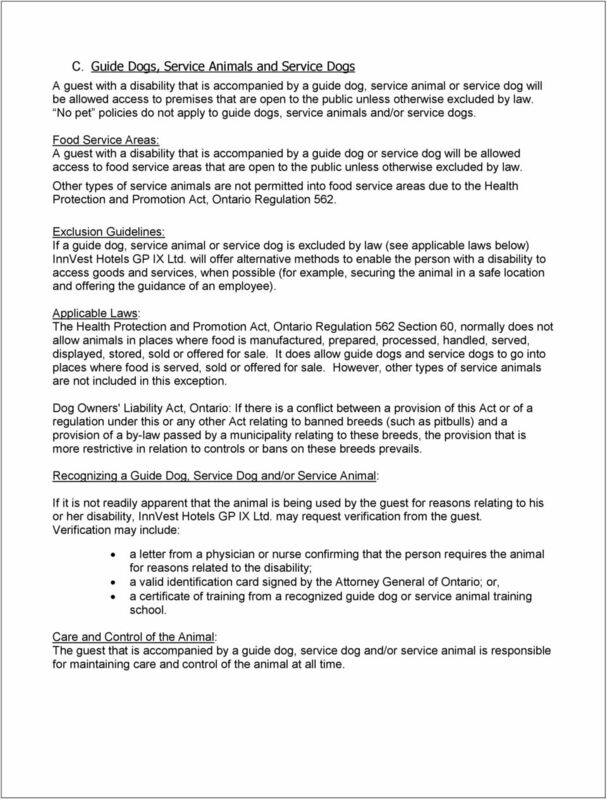 Other types of service animals are not permitted into food service areas due to the Health Protection and Promotion Act, Ontario Regulation 562. 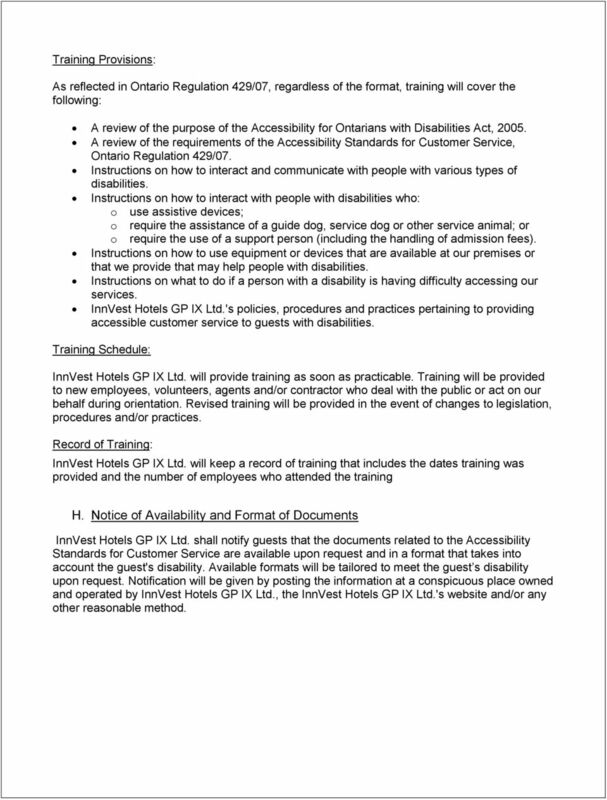 Exclusion Guidelines: If a guide dog, service animal or service dog is excluded by law (see applicable laws below) InnVest Hotels GP IX Ltd. will offer alternative methods to enable the person with a disability to access goods and services, when possible (for example, securing the animal in a safe location and offering the guidance of an employee). Applicable Laws: The Health Protection and Promotion Act, Ontario Regulation 562 Section 60, normally does not allow animals in places where food is manufactured, prepared, processed, handled, served, displayed, stored, sold or offered for sale. It does allow guide dogs and service dogs to go into places where food is served, sold or offered for sale. However, other types of service animals are not included in this exception. Dog Owners' Liability Act, Ontario: If there is a conflict between a provision of this Act or of a regulation under this or any other Act relating to banned breeds (such as pitbulls) and a provision of a by-law passed by a municipality relating to these breeds, the provision that is more restrictive in relation to controls or bans on these breeds prevails. 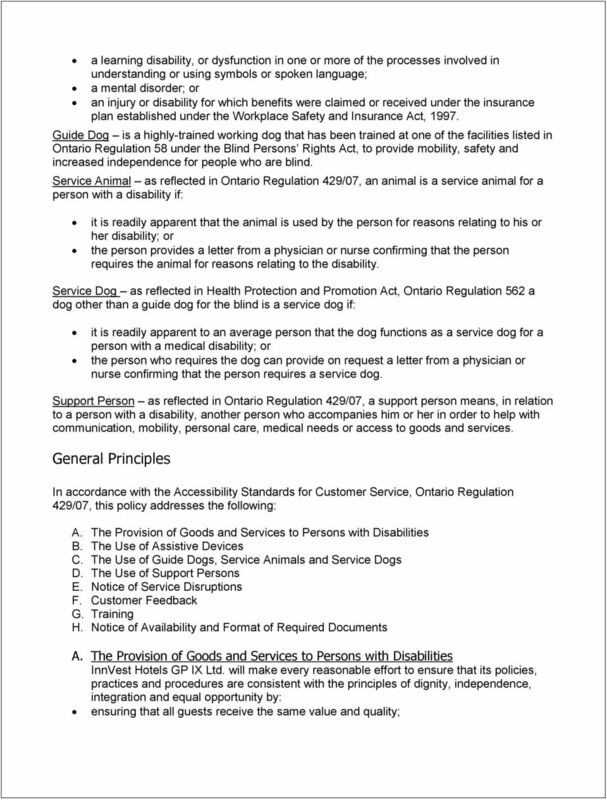 Recognizing a Guide Dog, Service Dog and/or Service Animal: If it is not readily apparent that the animal is being used by the guest for reasons relating to his or her disability, InnVest Hotels GP IX Ltd. may request verification from the guest. Verification may include: a letter from a physician or nurse confirming that the person requires the animal for reasons related to the disability; a valid identification card signed by the Attorney General of Ontario; or, a certificate of training from a recognized guide dog or service animal training school. Care and Control of the Animal: The guest that is accompanied by a guide dog, service dog and/or service animal is responsible for maintaining care and control of the animal at all time. 5 Allergies: If a health and safety concern presents itself, for example in the form of a severe allergy to the animal, InnVest Hotels GP IX Ltd. will make all reasonable efforts to meet the needs of all individuals. D. Support Persons If a guest with a disability is accompanied by a support person, InnVest Hotels GP IX Ltd. will ensure that both persons are allowed to enter the premises together and that the guest is not prevented from having access to the support person. In situations where confidential information might be discussed, consent will be obtained from the guest, prior to any conversation where confidential information might be discussed. Admission Fees: Fees will not be charged for support persons for admission to InnVest Hotels GP IX Ltd. s premises. E. Notice of Disruptions in Service Service disruptions may occur due to reasons that may or may not be within the control or knowledge of InnVest Hotels GP IX Ltd. 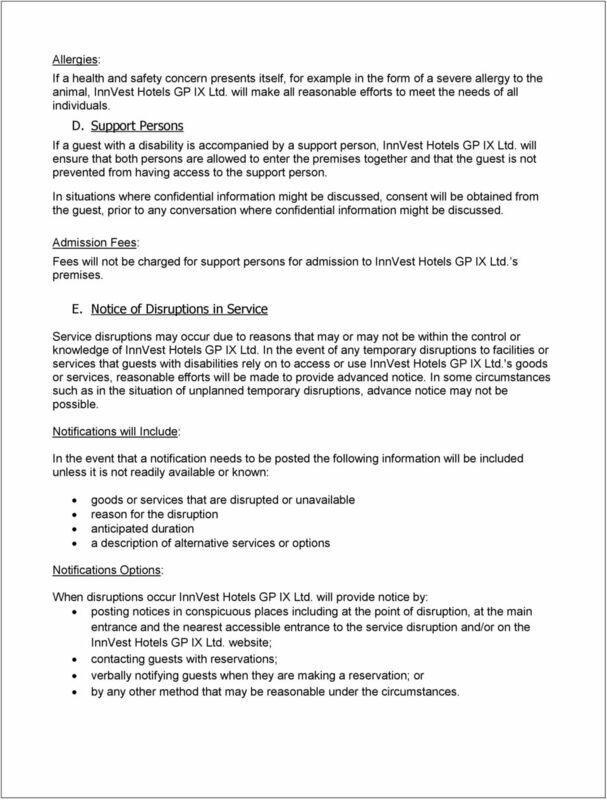 In the event of any temporary disruptions to facilities or services that guests with disabilities rely on to access or use InnVest Hotels GP IX Ltd.'s goods or services, reasonable efforts will be made to provide advanced notice. In some circumstances such as in the situation of unplanned temporary disruptions, advance notice may not be possible. Notifications will Include: In the event that a notification needs to be posted the following information will be included unless it is not readily available or known: goods or services that are disrupted or unavailable reason for the disruption anticipated duration a description of alternative services or options Notifications Options: When disruptions occur InnVest Hotels GP IX Ltd. will provide notice by: posting notices in conspicuous places including at the point of disruption, at the main entrance and the nearest accessible entrance to the service disruption and/or on the InnVest Hotels GP IX Ltd. website; contacting guests with reservations; verbally notifying guests when they are making a reservation; or by any other method that may be reasonable under the circumstances. 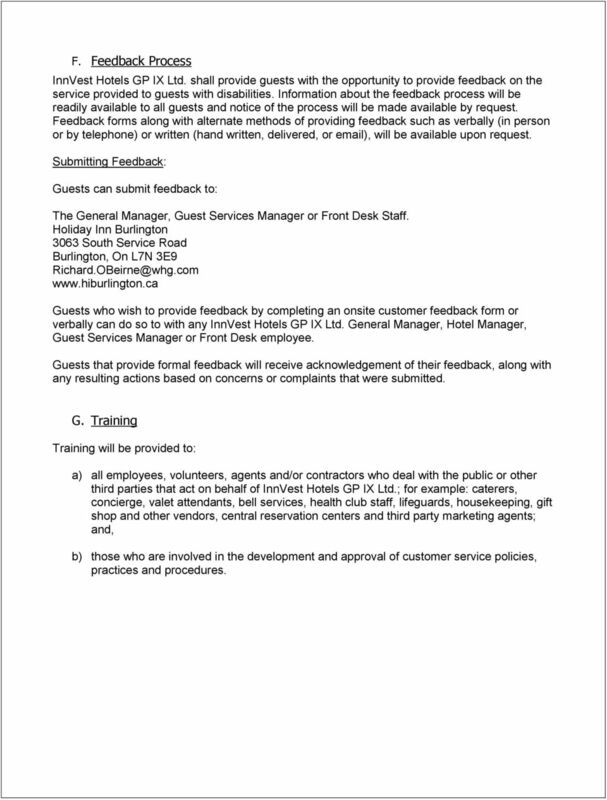 6 F. Feedback Process InnVest Hotels GP IX Ltd. shall provide guests with the opportunity to provide feedback on the service provided to guests with disabilities. Information about the feedback process will be readily available to all guests and notice of the process will be made available by request. Feedback forms along with alternate methods of providing feedback such as verbally (in person or by telephone) or written (hand written, delivered, or ), will be available upon request. Submitting Feedback: Guests can submit feedback to: The General Manager, Guest Services Manager or Front Desk Staff. Holiday Inn Burlington 3063 South Service Road Burlington, On L7N 3E9 Guests who wish to provide feedback by completing an onsite customer feedback form or verbally can do so to with any InnVest Hotels GP IX Ltd. General Manager, Hotel Manager, Guest Services Manager or Front Desk employee. Guests that provide formal feedback will receive acknowledgement of their feedback, along with any resulting actions based on concerns or complaints that were submitted. G. Training Training will be provided to: a) all employees, volunteers, agents and/or contractors who deal with the public or other third parties that act on behalf of InnVest Hotels GP IX Ltd.; for example: caterers, concierge, valet attendants, bell services, health club staff, lifeguards, housekeeping, gift shop and other vendors, central reservation centers and third party marketing agents; and, b) those who are involved in the development and approval of customer service policies, practices and procedures. 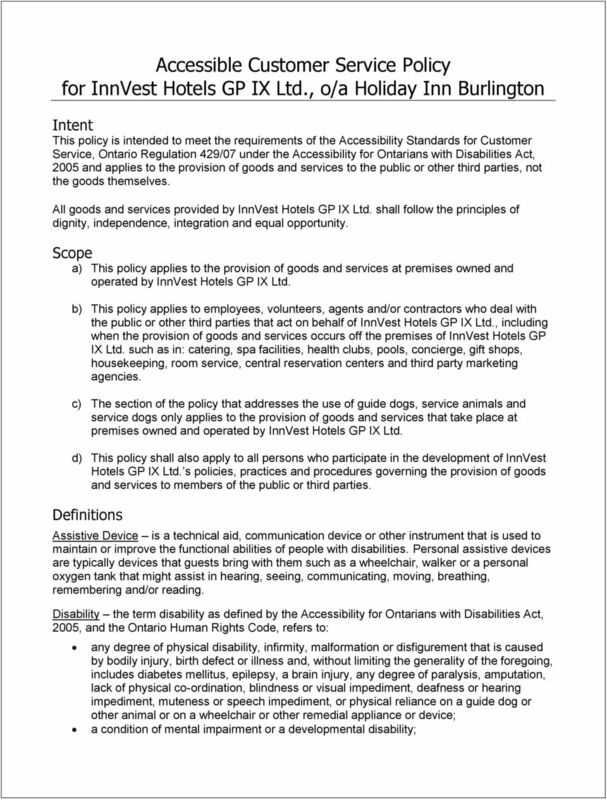 7 Training Provisions: As reflected in Ontario Regulation 429/07, regardless of the format, training will cover the following: A review of the purpose of the Accessibility for Ontarians with Disabilities Act, A review of the requirements of the Accessibility Standards for Customer Service, Ontario Regulation 429/07. Instructions on how to interact and communicate with people with various types of disabilities. Instructions on how to interact with people with disabilities who: o use assistive devices; o require the assistance of a guide dog, service dog or other service animal; or o require the use of a support person (including the handling of admission fees). Instructions on how to use equipment or devices that are available at our premises or that we provide that may help people with disabilities. Instructions on what to do if a person with a disability is having difficulty accessing our services. 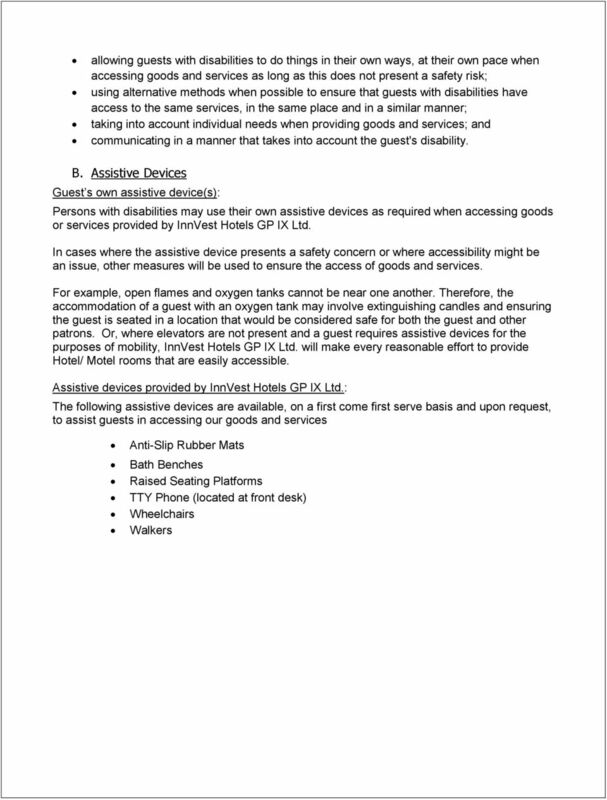 InnVest Hotels GP IX Ltd.'s policies, procedures and practices pertaining to providing accessible customer service to guests with disabilities. Training Schedule: InnVest Hotels GP IX Ltd. will provide training as soon as practicable. Training will be provided to new employees, volunteers, agents and/or contractor who deal with the public or act on our behalf during orientation. Revised training will be provided in the event of changes to legislation, procedures and/or practices. Record of Training: InnVest Hotels GP IX Ltd. will keep a record of training that includes the dates training was provided and the number of employees who attended the training H. Notice of Availability and Format of Documents InnVest Hotels GP IX Ltd. shall notify guests that the documents related to the Accessibility Standards for Customer Service are available upon request and in a format that takes into account the guest's disability. Available formats will be tailored to meet the guest s disability upon request. Notification will be given by posting the information at a conspicuous place owned and operated by InnVest Hotels GP IX Ltd., the InnVest Hotels GP IX Ltd.'s website and/or any other reasonable method. Section R9-10-301. R9-10-302. R9-10-303. R9-10-304. R9-10-305. R9-10-306. R9-10-307. R9-10-308. R9-10-309. R9-10-310. R9-10-311. R9-10-312. R9-10-313. R9-10-314. R9-10-315. R9-10-316. R9-10-317. R9-10-318.